T-2 Years? The Anticipated Fizzle-Out Of The Iridium Flares – Do Not Take Them For Granted! The following thoroughly depressing link was sent off – with a specific mention of the possibly extra-short future of the Iridium Flares many of us enjoy observing at night – by Kopernik member (and celebrity volunteer! – featured in a great article last month readable at pressconnects.com) George Normandin earlier this year. We’ve potentially lost 7 months already from the possible countdown with this approximate-ish late post to the CNYO site (my bad). Iridium satellite #6 (upper) and its replacement, #51, flaring 6 seconds apart in a 21.4-second exposure. The bright object on the right is Jupiter. Arcturus is the bright star at about the 7 o’clock position. Spica is just out of view in the lower right. 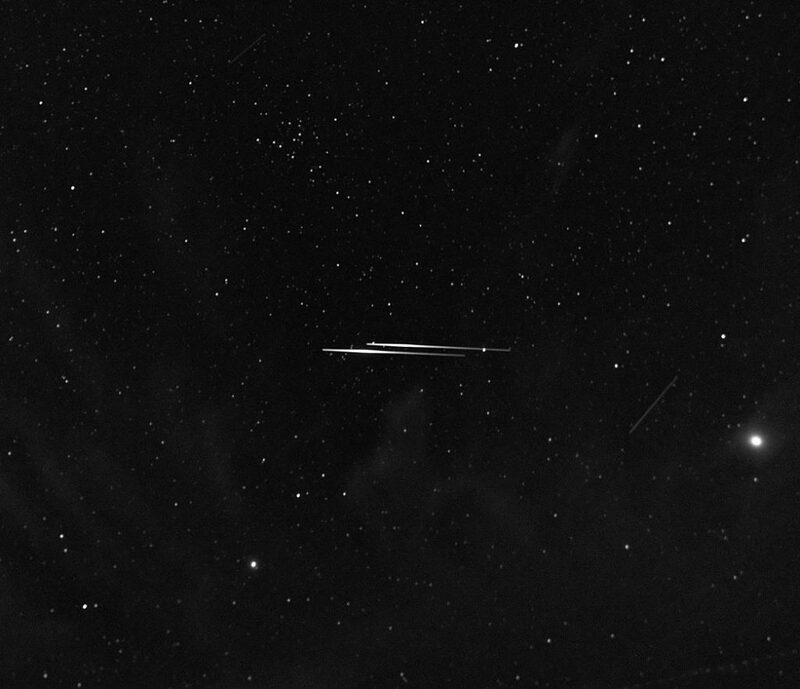 The satellites were moving left to right. Image by Jud McCranie. For the record, the bbc.com article title was a little less dramatic than the also excellent nationalgeographic.com and spaceflightnow.com articles about the same. One thing the new [Iridium NEXT satellites] satellites will not be capable of doing, however, is producing Iridium “flares”. These are the flashes in the sky that result when sunlight glints off the antennas of the old spacecraft. The new satellites do not have the same configuration, so once the original constellation is de-orbited the flashes will cease. “I’m afraid those who’ve been tracking that phenomenon over the past 20 years have another year or two to see it,” Mr Desch told BBC News. Iridium Flares are very easy to find once you know where – and when – to look. Predictions for your locale are easy to obtain from www.heavens-above.com/IridiumFlares.aspx. CNYO is pleased to announce a first chance for 2013 to get outdoors and do some late-winter observing. Members and their scopes plan to convene at the Syracuse Inner Harbor on the evening of Friday, March 8, combining what we expect to be a Messier Sprint with observing of Jupiter (perhaps Saturn if we stay late enough) and, hopefully, an early evening view of Comet Pan-STARRS in our Western Sky. Jupiter is high in the Night Sky and has been an excellent sight at Bob Piekiel’s Baltimore Woods observing sessions (with his next session slated for next Friday). Saturn will just clear the Eastern Sky around 11:00 p.m., which may or may not be too late for our first session (temperature-depending). The real treat for this weekend is Comet Pan-STARRS, which will be just at the edge of the Western Sky around sunset. At a predicted brightness of +1.5 magnitude, it will be Naked Eye (and one of three bright comets in our skies this year) for several days (provided Syracuse skies stay clear enough to observe it). The Messier Sprint – A longer explanation of what amateur astronomers know as a “Messier Marathon” is provided below. As a full Messier Marathon (observing all 110 objects) is an all-night endeavor and we’ll be running our first session from a less-than Dark Sky location, our sprint will focus on several bright clusters, binary stars, and other reasonably bright objects just to get our scopes outside and focusing. With that, keep track of the website and facebook page around 4:00 p.m. Friday afternoon for the official word on the start of our event. We hope you can join us! The marathon owes its existence to Charles Messier who, by all accounts (and to the best of my google efforts), never engaged in what he would have simply referred to as “The Me Marathon.” Messier was a famed French comet hunter (the search for comets in the 17th and 18th centuries was THE original “Space Race,” as such discoveries were sure to bring fame and prestige) who, with his assistant Pierre Méchain, catalogued what we know today as the Messier Objects specifically because he wanted to avoid these confusing objects in his cometary searches. Yes, the man who dedicated his life to finding comets is now best known for the catalogue of non-comets he generated. C’est la vie. The Messier Objects are simply a collection of clusters, nebulae, and galaxies that are visible through binoculars and low-power telescopes (and some are naked-eye objects). In effect, they are a collection of the “closest of the bright objects” that one might confuse with a comet, with the “closest/brightest” set including clusters and nebulae within the Milky Way and many galaxies far beyond our spiral arms. As massive, distant, and bright objects, they are stationary in the sky, making them easy for Messier to catalogue in his comet hunting efforts and, for us, making them useful guide posts both for their identification from Constellation markers and for the identification of far fainter objects based on proximity. There are 110 counted Messier Objects but, according to Pierre Méchain himself, only 109 actual objects, as M101 and M102 (the Pinwheel Galaxy) are the result of double-counting (on the bright side, when you’ve found it once, you’ve found it twice!). While the majority of the list goes back to Messier’s time, the last object added, M110, was included in 1960. Up! Well, more specifically, up in the Northern Hemisphere. As a French astronomer, Messier’s catalogue contains only objects observable from his Observatory. Accordingly, all 110 objects are visible from Northern Latitudes. That means that (1) a multitude of objects in the Southern Hemisphere that WOULD have made the Messier list are not included because he simply could not point his scope into the ground to look at them and (2) those in the Southern Hemisphere do not engage in Messier Marathons as much as they engage in Messier Sprints, as they have fewer objects to identify (and, the further South they are, the shorter their list is). Members of the Messier list grace our skies all year, with nearly every Constellation visible in the Northern Hemisphere hosting at least one object. Only two things in the Night Sky can obscure Messier objects. The first of these is “whatever else you want to see” that keeps you from looking for the Messiers. The second is the Moon, which can, in fact, obscure the Messier objects considerably (those that are naked-eye Messiers then require binoculars to see, those that are binocular Messiers then require either patience or higher power). There is one reasonably broad “sweet spot” in the calendar year during which it is POSSIBLE to see every Messier object, with the rotation of the Earth responsible for bringing the entire list to your tripod. This is, of course, only possible because clouds, the irregularity of the horizon (such as our trees to the South and Syracuse to our North), and your ability to remain awake all factor considerably in your success. This time of year is mid-March through early April. An experienced Messier hunter can find the complete set of objects in a pair of 10×50 binoculars. As the goal to some Marathoners is “quantity, not quality,” a low-power pair of binoculars are best for both speed and movement (although your neck will begin to object to objects at your zenith). If I may sneak in a “tortoise and hare” comparison, there’s nothing wrong with finding 20 objects and enjoying the view. You have ALL YEAR to complete your Marathon. They’re not going anywhere! CNYO is delighted to have our first scheduled lecture of the year occur at Beaver Lake Nature Center in Baldwinsville, NY. In a change from the last three lectures hosted at Beaver Lake, there will be NO indoor lecture session. We’ll be running the entire discussion from the central yard in front of the main building, starting the lecture near the setting of the Sun and driving the discussion of Constellations and planets as they appear to our dark-adapting eyes. Thursday, April 25 (Rain Date: Thursday, May 2nd), 7:30 p.m.
Age Range: There are no age requirements, but please be aware (and make children aware) that fragile and expensive observing equipment will be present. Description:The Constellations have been with us for thousands of years, but you only have a few good clear nights each month to memorize their positions as they slowly move across the sky! This outdoor lecture by the CNY Observers (www.cnyo.org) will briefly describe the history and importance of the Constellations as mythological, agricultural, and navigational guides, then will describe a simple system to begin to learn their relative positions. At the same time, Jupiter and Saturn are on opposite sides of the Southern sky, making excellent targets for binocular and telescope observing.